A teenager has been killed in what officials in Nepal have described as a "rare" attack by a tiger. Police say that the attack took place as the 17-year-old went in to the Chitwan National Park to cut grass with four friends. The others escaped. Experts say there have been fewer tiger attacks in Nepal in recent years because of their declining numbers. Meanwhile three people were hurt by a leopard in a village near the capital Kathmandu. Newspaper reports say villagers were left terrorised by the attack. Unlike most "man-eating" tigers, aggressive leopards are less afraid to enter human settlements, experts say. The leopard responsible for the latest attack has not yet been captured and is still reported to be roaming the area. A policeman was among the injured. 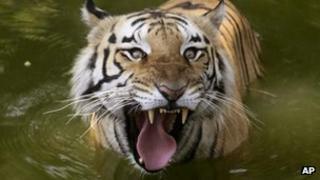 Experts say that tiger attacks in Nepal are rare compared with 100 years ago when one of the country's most famous "man-eaters" roamed the forests. The Champawat Tigress is reported to have killed about 200 men and women before being driven out of Nepal into what is now the state of Uttarakhand in northern India. She continued to kill there, and her total number of human victims was estimated at 430. The tigress was finally tracked down and killed by the legendary hunter Jim Corbett in 1907. End of the tiger tale?